… Or a lot of horsepower. Today I’m uploading the propulsion module for my, recently renamed, Deep Space Fuel Station. This propulsion module includes a heavy Kethane converter, three heavy Kethane Drilling Units and 39 atomic rocket motors that produce up to 2340 kN of thrust at max throttle. The plan is to land this sucker on moons to top off the tanks attached to the Orbital Fuel Depot before exploring the beefier (and more fuel hungry) planet nearby. With 35,685 units of LiquidFuel capacity, it can bring up HUGE hauls from the surface of most moons to supply the Deep Space Fuel Station with plenty of resources with which to launch missions. I opted to perform fuel refinery on the surface because of the ratio of kethane to usable resource output, which will save me a lot of fuel getting the same amount of LiquidFuel off of the moon as a result. The whole idea of this project is efficiency. The next step is to construct this thing. 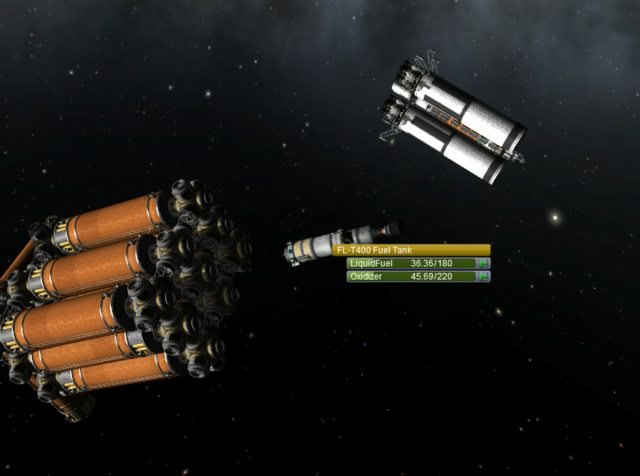 Because my design plans changed halfway through the build, the components of the Deep Space Fuel Station are not assembled in optimal order and I must rebuild them in orbit. In the image below you can see the Skylab 2 Tug moving to dock with the primary fuel array to remove it from dock with Skylab 2 and connect it to the DSFS propulsion unit that you see floating in the background. 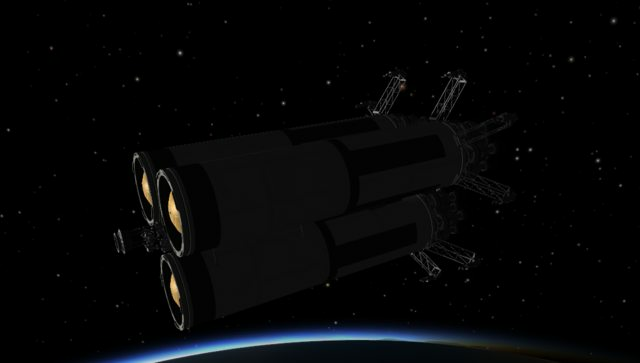 The station tug would not have enough RCS thrust to realistically move the fuel array due to the sheer mass of the fuel array so it relies on the RCS thruster blocks that are on the fuel array to accomplish this. The station tug is simply acting as the brains of the operation by controlling the RCS blocks on the fuel array. In the image below you can see now the tug is moving the fuel array to the propulsion unit. This is a very slow process because even with all of the RCS thrusters on the fuel array and tug, the thrust-to-weight ratio is still very small because the fuel array is quite massive. In closing the distance and not paying attention, I accidentally bumped the propulsion unit with the fuel array because I forgot to click the leading docking coupler and click “control from here”. The tug was trying to dock to the tug’s only docking port which is already docked to the fuel array! Go me! Now I have to switch to the propulsion unit and use SAS to stop all rotation so I can actually dock to it. I wish I had quicksaved! The next step after I’ve attached the fuel array to the propulsion array is to rearrange the current space station. 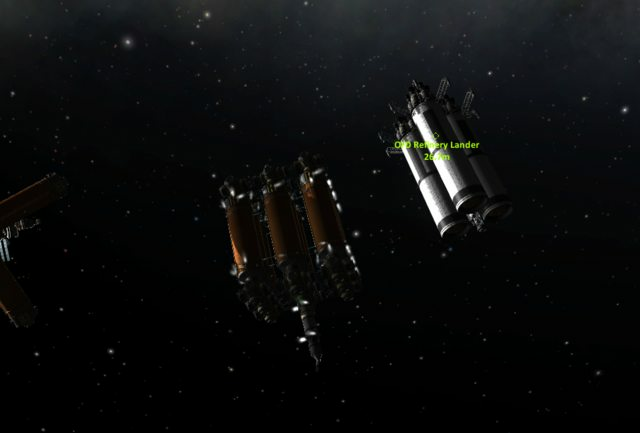 I need to move the three existing fuel tanks and their multiport coupler to another location so I can move the control gondola for the DSFS that is sitting behind the old fuel tank array. I’m going to move the old fuel array to the far side of the space station to give me a centerline of inertia, which should make the station a little more stable. Once all of this is complete, I just need to move the control Cupola to the partially constructed DSFS and then redock with Skylab 2. More on that at a later date!